As Guy Phillips mentioned, last weekend was Father's Day. Did you know that SumnerOne has been owned and operated by three generations of fathers and their children? We've been operating under the Sumner name since 1955! One topic that wasn't as prevalent when we opened our doors is that of helping businesses to stay up-to-date on their software licensing, however, we now have that covered. Our IT expert, Chadd Haselhorst joined the crew over at The Big 550 KTRS to talk about tips for staying compliant with your software licenses last week on Tech Talk. Why do software licenses matter? So you have a computer, but its the software on your device that helps you to complete a task. Some devices come with software services built in, but depending on what you are needing to do, you may have to buy extra or special software. With any other service, there are limitations, expiration dates, and associated fees and software is no exception. Chadd even explained that if a business is out of compliance with the rules of their software, there can be hefty fines associated! The Business Software Alliance was established to help ensure that companies are following the proper rules regarding their software usage. The BSA has fined companies as much as 1 million for being out of compliance with the limitations and restrictions on their software licenses. Can you use a new device with old software? The answer to this depends on the type of software you are wanting to transfer to your new device, there are a few answers. One Machine Only - Some software only allow you to install once and on one machine. In this case, you're just out of luck unless you want to buy the same software for your new device. Uninstall & Reinstall - Companies understand that people using their software buy new devices. In this case, certain licenses will allow the user to uninstall from one device and then simply reinstall your software. Multi-Device Install - Multi-Device installs exist but can very from software to software. This means that some licenses allow for users to use the software on multiple devices at the same time, however, the number of different devices can vary. If your software allows for multi-device install, just do your due diligence and see what your license entails. 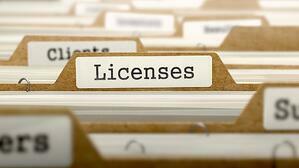 Understanding software licenses and limitations is something that SumnerOne can help with too. Got questions? Give our experts at SumnerOne a call. Be sure to tune in this Friday afternoon at 4:20 for our next Tech Talk segment with the Guy Phillips Show on KTRS! Click below to check out last weeks full video from Tech Talk.